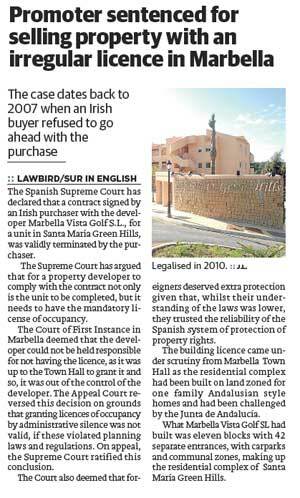 The Spanish Supreme Court has declared that a contract signed by an Irish purchaser with the developer Marbella Vista Golf S.L., for a unit in Santa Maria Green Hills, was validly terminated by the purchaser. The Supreme Court has argued that for a property developer to comply with the contract not only is the unit to be completed, but it needs to have the mandatory license of occupancy. The Court also deemed that foreigners deserved extra protection given that, whilst their understanding of the laws was lower, they trusted the reliability of the Spanish system of protection of property rights. The building licence came under scrutiny from Marbella Town Hall as the residential complex had been built on land zoned for one family Andalusian style homes and had been challenged by the Junta de Andalucía. What Marbella Vista Golf SL had built was eleven blocks with 42 separate entrances, with carparks and communal zones, making up the residential complex of Santa María Green Hills. This entry was posted in In the Media and tagged Marbella Vista Golf S.L., Santa Maria Green Hills on March 28, 2013 by admin.